What is duodenitis? Duodenitis is the inflammation of the duodenum, which is the first segment of your small intestine. It is what connects your stomach to the rest of your digestive system. Sudden, sharp abdominal pains that last for a short time may indicate acute duodenitis. Chronic duodenitis is progressive, and may continue for months and sometimes years. This inflammation can lead to simple symptoms like bloating and excessive gas as well as the more serious chest pain and bleeding in your intestines. And, it’s more common than you think. There are several different types of duodenitis, which include acute and chronic, erosive and non-erosive, and bulbar and post-bulbar. Acute duodenitis is characterized by a sudden onset of symptoms, and persists for just a short period of time. Chronic duodenitis takes place over a longer time period such as months or years. The symptoms of chronic duodenitis tend to be the same over the majority of the inflammation period, with brief stints of severe symptoms. With erosive duodenitis, the inflammation has become so severe that duodenum walls have eroded and produced open wounds. In this form, the inflammation is extensive, but the walls of the duodenum have not eroded. Another factor in the classification of duodenitis is its location in relation to the duodenal bulb, which is the first two inches of the duodenum that lies adjacent to the pylorus of the stomach. With bulbar duodenitis, the inflammation centers on the duodenum bulb, especially the anterior part of the wall. Post-bulbar duodenitis occurs below the duodenum bulb, and is also divided into two subcategories. Proximal post-bulbar duodenitis occurs after the bulb—close to the bulb but not within it. 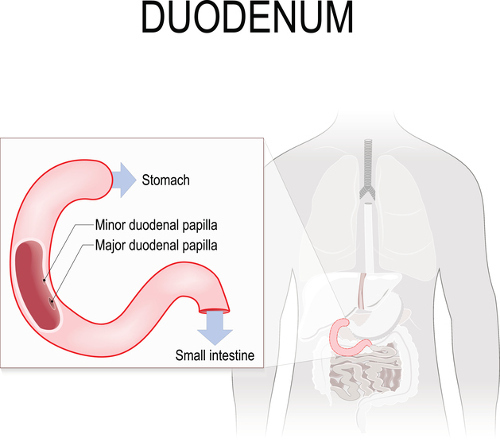 Distal post-bulbar duodenitis occurs further away, closer to the jejunum (which lies between the duodenum and the ileum). There are two main causes of an inflamed duodenum: Helicobacter pylori (H. pylori) infection and the excessive use of non-steroidal anti-inflammatory drugs or NSAIDs. H. pylori are bacteria that dig into the wall of the stomach and duodenum. As they can survive the strong gastric acids present in these areas, the bacteria may not be stopped by the stomach’s natural defenses. NSAIDs are painkilling drugs like aspirin and ibuprofen. These drugs can increase the acidity of gastric acid, as well as compromise the mucus barrier of the stomach. Your duodenitis may be caused by this increase in gastric acid secretion. Disruption of the protective mechanisms in the duodenum, like reduced mucus production, can also lead the duodenum to become inflamed. Most of the symptoms of duodenitis are similar to those of other stomach-related afflictions: nausea, pain, vomiting, and loss of appetite. The inflammation and irritation of the duodenum can cause a person to suffer from nausea. In extreme cases, vomiting may also occur, but it is uncommon. Abdominal discomfort and pain may occur, usually in the upper-middle area of the stomach. The severity of pain could depend on the type of duodenitis. Erosive types will usually produce more pain due to the damage of the stomach lining. Eating may aggravate the pain, as it can agitate the stomach acid in an organ that is already damaged. Due to the existing stomach discomfort, it is common for sufferers to develop a loss of appetite. As mentioned, eating may trigger pain. Other common symptoms may also include excessive gas and difficulty sleeping due to the other symptoms. In serious cases, erosive forms may cause internal bleeding and blood in the stool as well as abdominal distension. Duodenitis can be challenging to diagnose on symptoms alone, as most of the symptoms are very similar to those of gastritis (inflammation of the lining of the stomach). In fact, the two conditions are closely related; duodenitis can often cause gastritis. As a result, doctors tend to recommend a procedure in order to confirm a diagnosis. The most common is an upper gastrointestinal (GI) endoscopy. Duodenitis treatment can depend on the severity of the duodenitis, and usually consists of some form of medication combined with dietary and lifestyle changes. Medications like antibiotics are usually prescribed to clear out any bacterial infections that are causing the inflammation. Acid-suppressing drugs such as histamine 2 (H2) blockers and proton pump inhibitors are also used to reduce pain and allow healing in the stomach. Bismuth-based drugs (like bismuth subsalicylate) can be used to make up for the lack of mucus by coating the intestinal lining and helping to reduce the inflammation. Spicy foods, fatty foods, and coffee can aggravate stomach acid, the stomach lining, and the duodenum. To help alleviate the symptoms of duodenitis and encourage quicker healing, doctors suggest avoiding these types of foods. While an alcoholic drink or two may not necessarily cause any adverse effects (there is a chance it may aggravate your symptoms), excessive drinking can definitely cause problems and should also be avoided. Smoking can also irritate the stomach, and not smoking during the period of duodenitis is recommended. Avoid non-steroidal anti-inflammatory drugs like aspirin and ibuprofen, as they may be partially to blame for your duodenitis. There are a number of home remedies that may help you treat the various symptoms of duodenitis. Eating foods that are high in fiber like oats, barley, carrots, lentils, and beans can help give the body fuel to heal the duodenitis as well as help to settle stomach acid. This could also give the stomach a break from irritants so that it can properly heal. Chamomile tea contains alpha-bisabolol, alpha-bisabolol oxides A & B, and matricin, which are all anti-inflammatory compounds that might help reduce inflammation of the duodenum. A hot beverage may cause irritation, so trying chamomile tea at a lukewarm or even cold temperature may be a better way to consume it. Yogurt contains probiotics and other good bacterial cultures that could help settle stomach acid, allowing the duodenum and the stomach time to repair themselves. Natural honey, especially varieties like Manuka honey, has chemical properties that produce a natural form of hydrogen peroxide. This makes honey a popular natural remedy for bacterial infections. Taking a spoonful of honey could help eliminate the unwanted bacteria causing your duodenitis. If left untreated, duodenitis may bring about health complications that require treatment either simultaneously or separately from the inflammation. Some of the following conditions will produce a host of additional issues. Inflamed duodenum symptoms are nothing to scoff at. They can cause lack of sleep, pain, and loss of appetite. At its worst, duodenitis can cause ulcers and internal bleeding. If you have a burning sensation in your abdomen that lasts for more than a few days, make sure to get it checked out. While duodenitis is fairly easy to treat, it is not a medical issue that you want to experience long term. Wu, B., Kivi, R., “Gastritis/Duodenitis,” Healthline, November 23, 2015; http://www.healthline.com/health/gastritis-duodenitis#overview1, last accessed August 18, 2017. “Duodenitis (small intestine) Causes, Symptoms, and Treatment,” Phaa; http://www.phaa.com/duodenitis-small-intestine-causes-symptoms-and-treatment.htm, last accessed August 18, 2017. “Duodenitis (Duodenal Inflammation) Types, Causes, Symptoms, Treatment,” Health Hype; http://www.healthhype.com/duodenitis-duodenal-inflammation-types-causes-symptoms-treatment.html, last accessed August 18, 2017. “Duodenitis,” Health Grades; https://www.healthgrades.com/right-care/digestive-health/duodenitis, last accessed August 18, 2017. “Duodenitis,” Medical Point; https://medicalpoint.org/duodenitis/, last accessed August 18, 2017. “What Is Gastritis?” WebMD; http://www.webmd.com/digestive-disorders/digestive-diseases-gastritis#1, last accessed August 18, 2017. Gandhi, M., “Home Remedies for Duodenitis,” Mav Cure; https://mavcure.com/home-remedies-duodenitis/, last accessed August 18, 2017. “8 Amazing Home Remedies For Duodenitis,” Organic Facts; https://www.organicfacts.net/home-remedies/home-remedies-for-duodenitis.html, last accessed August 18, 2017.